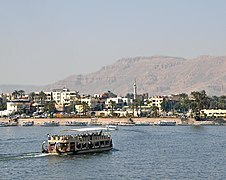 The Nile (Arabic: النيل‎, written as al-Nīl; pronounced as an-Nīl) is a major north-flowing river in northeastern Africa, and is the longest river in Africa and in the world, though some sources cite the Amazon River as the longest. The Nile, which is about 6,650 km (4,130 mi)[n 1] long, is an "international" river as its drainage basin covers eleven countries, namely, Tanzania, Uganda, Rwanda, Burundi, the Democratic Republic of the Congo, Kenya, Ethiopia, Eritrea, South Sudan, Republic of the Sudan and Egypt. 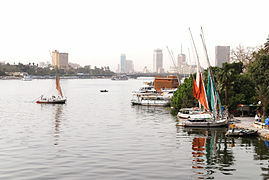 In particular, the Nile is the primary water source of Egypt and Sudan. The northern section of the river flows north almost entirely through the Sudanese desert to Egypt, then ends in a large delta and flows into the Mediterranean Sea. Egyptian civilization and Sudanese kingdoms have depended on the river since ancient times. Most of the population and cities of Egypt lie along those parts of the Nile valley north of Aswan, and nearly all the cultural and historical sites of Ancient Egypt are found along river banks. In the ancient Egyptian language, the Nile is called Ḥ'pī (Hapy) or Iteru, meaning "river". In Coptic, the word ⲫⲓⲁⲣⲱ, pronounced piaro (Sahidic) or phiaro (Bohairic), means "the river" (lit. p(h).iar-o "the.canal-great"), and comes from the same ancient name. In Egyptian Arabic, the Nile is called en-Nīl while in Standard Arabic it is called an-Nīl. In Biblical Hebrew: הַיְאוֹר, Ha-Ye'or or הַשִׁיחוֹר, Ha-Shiḥor. The English name Nile and the Arabic names en-Nîl and an-Nîl both derive from the Latin Nilus and the Ancient Greek Νεῖλος. Beyond that, however, the etymology is disputed. Hesiod at his Theogony refers that Nilus (Νεῖλος) was one of the Potamoi (river gods), son of Oceanus and Tethys. Another derivation of Nile might be related to the term Nil (Sanskrit: नील, translit. nila; Egyptian Arabic: نيلة‎), which refers to Indigofera tinctoria, one of the original sources of indigo dye; or Nymphaea caerulea, known as "The Sacred Blue Lily of the Nile", which was found scattered over Tutankhamen’s corpse when it was located in 1922. With a total length of about 6,650 km (4,130 mi)[n 1] between the region of Lake Victoria and the Mediterranean Sea, the Nile is the longest river on the African continent. The drainage basin of the Nile covers 3,254,555 square kilometers (1,256,591 sq mi), about 10% of the area of Africa. Compared to other major rivers, though, the Nile carries little water (5% of the Congo's river, for example). The Nile basin is complex, and because of this, the discharge at any given point along the mainstem depends on many factors including weather, diversions, evaporation and evapotranspiration, and groundwater flow. Below the confluence with the Blue Nile the only major tributary is the Atbara River, roughly halfway to the sea, which originates in Ethiopia north of Lake Tana, and is around 800 kilometers (500 mi) long. The Atbara flows only while there is rain in Ethiopia and dries very rapidly. During the dry period of January to June, it typically dries up north of Khartoum. The Yellow Nile is a former tributary that connected the Ouaddaï Highlands of eastern Chad to the Nile River Valley c. 8000 to c. 1000 BCE. Its remains are known as the Wadi Howar. The wadi passes through Gharb Darfur near the northern border with Chad and meets up with the Nile near the southern point of the Great Bend. The present Nile is at least the fifth river that has flowed north from the Ethiopian Highlands. Satellite imagery was used to identify dry watercourses in the desert to the west of the Nile. A canyon, now filled by surface drift, represents an ancestral Nile called the Eonile that flowed during the later Miocene (23–5.3 million years before present). The Eonile transported clastic sediments to the Mediterranean; several natural gas fields have been discovered within these sediments. The other theory is that the drainage from Ethiopia via rivers equivalent to the Blue Nile, the Atbara and the Takazze flowed to the Mediterranean via the Egyptian Nile since well back into Tertiary times. Salama suggested that during the Paleogene and Neogene Periods (66 million to 2.588 million years ago) a series of separate closed continental basins each occupied one of the major parts of the Sudanese Rift System: Mellut rift, White Nile rift, Blue Nile rift, Atbara rift and Sag El Naam rift. The Mellut Rift Basin is nearly 12 kilometers (7.5 mi) deep at its central part. This rift is possibly still active, with reported tectonic activity in its northern and southern boundaries. The Sudd swamps which form the central part of the basin may still be subsiding. 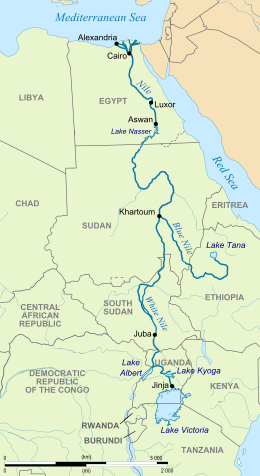 The White Nile Rift System, although shallower than the Bahr el Arab rift, is about 9 kilometers (5.6 mi) deep. Geophysical exploration of the Blue Nile Rift System estimated the depth of the sediments to be 5–9 kilometers (3.1–5.6 mi). These basins were not interconnected until their subsidence ceased, and the rate of sediment deposition was enough to fill and connect them. 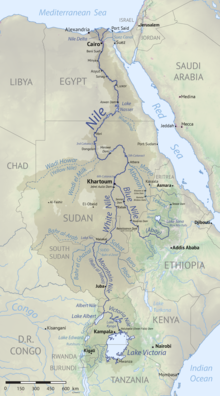 The Egyptian Nile connected to the Sudanese Nile, which captures the Ethiopian and Equatorial headwaters during the current stages of tectonic activity in the Eastern, Central and Sudanese Rift Systems. The connection of the different Niles occurred during cyclic wet periods. The River Atbara overflowed its closed basin during the wet periods that occurred about 100,000 to 120,000 years ago. The Blue Nile connected to the main Nile during the 70,000–80,000 years B.P. wet period. The White Nile system in Bahr El Arab and White Nile Rifts remained a closed lake until the connection of the Victoria Nile to the main system some 12,500 years ago during the African humid period. John Hanning Speke c. 1863. 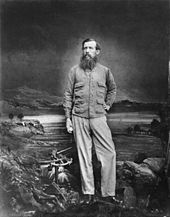 Speke was the Victorian explorer who first reached Lake Victoria in 1858, returning to establish it as the source of the Nile by 1862. 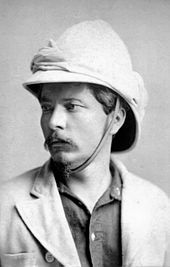 Henry Morton Stanley in 1872. Stanley circumnavigated the lake and confirmed Speke's observations in 1875. Europeans began to learn about the origins of the Nile in the 14th century when the Pope sent monks as emissaries to Mongolia who passed India, the middle east and Africa, and described being told of the source of the Nile in Abyssinia (ancient European name for Ethiopia) Later in the 15th and 16th centuries, travelers to Ethiopia visited Lake Tana and the source of the Blue Nile in the mountains south of the lake. Although James Bruce claimed to be the first European to have visited the headwaters, modern writers give the credit to the Jesuit Pedro Páez. Páez's account of the source of the Nile is a long and vivid account of Ethiopia. It was published in full only in the early 20th century, although it was featured in works of Páez's contemporaries, including Baltazar Téllez, Athanasius Kircher and by Johann Michael Vansleb. 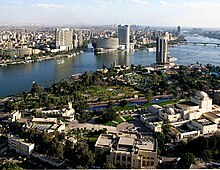 The Nile passes through Cairo, Egypt's capital city. A computer simulation study to plan the economic development of the Nile was directed by H.A.W. Morrice and W.N. Allan, for the Ministry of Hydro-power of the Republic of the Sudan, during 1955–1957 Morrice was their Hydrological Adviser, and Allan his predecessor. M.P. Barnett directed the software development and computer operations. The calculations were enabled by accurate monthly inflow data collected for 50 years. The underlying principle was the use of over-year storage, to conserve water from rainy years for use in dry years. Irrigation, navigation and other needs were considered. Each computer run postulated a set of reservoirs and operating equations for the release of water as a function of the month and the levels upstream. The behavior that would have resulted given the inflow data was modeled. Over 600 models were run. Recommendations were made to the Sudanese authorities. The calculations were run on an IBM 650 computer. Simulation studies to design water resources are discussed further in the article on hydrology transport models, that have been used since the 1980s to analyze water quality. In 1951, the American John Goddard together with two French explorers became the first to successfully navigate the entire Nile river from its source in Burundi at the potential headsprings of the Kagera River in Burundi to its mouth on the Mediterranean Sea, a journey of approximately 6,800 km (4,200 mi). Their 9-month journey is described in the book ‘Kayaks down the Nile’. 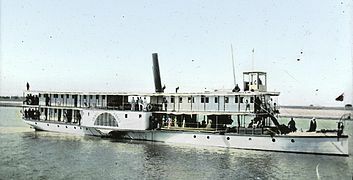 The White Nile Expedition, led by South African national Hendrik Coetzee, navigated the White Nile's entire length of approximately 5,800 kilometres (3,600 mi). The expedition began at the White Nile's beginning at Lake Victoria in Uganda, on 17 January 2004 and arrived safely at the Mediterranean in Rosetta, four and a half months later. On the 30th of April 2005 a team led by South Africans Peter Meredith and Hendrik Coetzee, following again in the footsteps of John Goddard, navigated the major remote source of the White Nile, the Akagera river that starts as the Ruvyironza in Bururi Province, Burundi, and ends at Lake Victoria, Uganda. 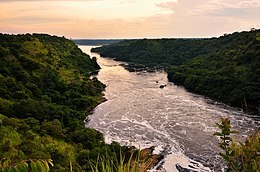 In April 2006, the Ascend the Nile Expedition including two explorers from Britain and one from New Zealand ascended the river from its mouth at Rosetta to one of its sources in Rwanda's Nyungwe Forest. The Team including Cam McLeay, Neil McGrigor and Garth MacIntyre spent 70 days travelling to the Rwandese source of the Nile covering approximately 6800 kilometres. During the Expedition they were ambushed by the LRA (Lord's Resistance Army) led by the notorious Joseph Kony, however post-attack six months later they returned to complete the expedition. They measured the length of the river with the help of GPS and claimed to have found the furthest source. Due to the unscientific approach of their expedition, their reluctance to release the GPS data, and not having measured the other contender for the true source of the Nile in Burundi, controversy has ensued. The Blue Nile Expedition, led by geologist Pasquale Scaturro and his partner, kayaker and documentary filmmaker Gordon Brown became the first people to descend the entire Blue Nile, from Lake Tana in Ethiopia to the beaches of Alexandria on the Mediterranean. Their approximately 5,230-kilometre (3,250 mi) journey took 114 days, from 25 December 2003 to 28 April 2004. Though their expedition included others, Brown and Scaturro were the only ones to complete the entire journey. Although they descended whitewater manually the team used outboard motors for much of their journey. The Nile flows through Cairo, here contrasting ancient customs of daily life with the modern city of today. Travels in Ethiopia Above the Second Cateract of the Nile; Exhibiting the State of That Country and Its Various Inhabitants Under the Dominion of Mohammed Ali; and Illustrating the Antiquities, Arts, and History of the Ancient Kingdom of Meroe, G.A. Hoskins. Longman, Rees, Orme, Brown, Green, & Longman, London; 1835. ^ a b c The length of the Nile is usually said to be about 6,650 km (4,130 mi), but reported values lie anywhere between 5,499 km (3,417 mi) and 7,088 km (4,404 mi). The length measurements of many rivers are only approximations and may differ from each other because there are many factors that determine the calculated river length, such as the position of the geographical source and the mouth, the scale of measurement, and the length measuring techniques (see also List of rivers by length). ^ a b "Nile River". Encyclopædia Britannica. Archived from the original on 29 April 2015. ^ a b c Liu, Shaochuang; Lu, P; Liu, D; Jin, P; Wang, W (2009-03-01). "Pinpointing the sources and measuring the lengths of the principal rivers of the world". Int. J. Digital Earth. 2: 80–87. doi:10.1080/17538940902746082. ^ "How Long Is the Amazon River?". Encyclopedia Britannica. Retrieved 2018-12-24. ^ "Where Does the Amazon River Begin?". National Geographic News. 2014-02-15. Retrieved 2018-12-25. ^ Oloo, Adams (2007). "The Quest for Cooperation in the Nile Water Conflicts: A Case for Eritrea" (PDF). African Sociological Review. 11 (1). Archived (PDF) from the original on 27 September 2011. Retrieved 25 July 2011. ^ "What's the Blue Nile and the White Nile?". The Times of India. Archived from the original on 8 March 2017. Retrieved 31 July 2017. ^ a b Daniel Hillel (2007). "The Natural History of the Bible: An Environmental Exploration of the Hebrew Scriptures". Columbia University Press. p. 88. ISBN 978-0-231-13363-0. ^ "Nile". Oxford English Dictionary (3 ed.). Oxford: Oxford University Press. 2009. ^ a b c Chisholm, Hugh, ed. (1911). "Nile § Name" . Encyclopædia Britannica. 19 (11th ed.). Cambridge University Press. p. 693. Νεῖλόν τ᾽ Ἀλφειόν τε καὶ Ἠριδανὸν βαθυδίνην» (Hesiod, "Theogony", 337–338). ^ Marijke Eken (2012). "The origin of the word INDIGO and ANILA" (PDF). mekenart.com. ^ "Sacred blue lily of the Nile". Loch Ness Water Gardens. ^ "Nile". Online Etymology Dictionary. Archived from the original on 8 March 2013. Retrieved 20 January 2013. ^ Chisholm, Hugh, ed. (1911). "Nile" . Encyclopædia Britannica. 19 (11th ed.). Cambridge University Press. p. 695. ^ "The Nile River". Nile Basin Initiative. 2011. Archived from the original on 2 September 2010. Retrieved 1 February 2011. ^ "Bridging the Gap in the Nile Waters Dispute". Crisis Group. 2019-03-20. Retrieved 2019-04-06. ^ McLeay, Cam (2 July 2006). "The Truth About the Source of R. Nile". New Vision. Archived from the original on 9 April 2011. Retrieved 31 August 2011. ^ "Nile River". Archived from the original on 10 January 2007. Retrieved 5 February 2011. ^ "Team Reaches Nile's 'True Source'". BBC News. 31 March 2006. Archived from the original on 1 June 2013. Retrieved 4 April 2011. ^ Described in Joanna Lumley's Nile, 7 pm to 8 pm, ITV, Sunday 12 August 2011. ^ "Journey to the source of the Nile". Telegraph. Archived from the original on 3 May 2012. Retrieved 6 September 2012. ^ Arabic bahr can refer to either seas or large rivers. ^ Hurst H.E. ; et al. (2011). "The Nile Basins |volume 1 The Hydrology of the Blue Nile and Akbara and the Main Nile to Aswan, with some Reference to the Projects Nile control Dept. paper 12" (PDF). Cairo: Government Printing office. Archived (PDF) from the original on 26 July 2011. ^ J. V. Sutcliffe & Y.P. Parks (1999). "12". The Hydrology of the Nile (PDF). IAHS Special Publication no. 5. p. 161. Archived from the original (PDF) on 24 November 2010. ^ BGN/PCGN. "Romanization System for Amharic Archived 13 February 2013 at the Wayback Machine". 1967. Hosted at the National Geospatial Intelligence Agency, 2013. Accessed 28 Feb 2014. ^ See also: BGN/PCGN romanization. ^ "Blue Nile River | river, Africa". Encyclopedia Britannica. Archived from the original on 1 August 2017. Retrieved 31 July 2017. ^ "Two Niles Meet : Image of the Day". earthobservatory.nasa.gov. 26 April 2013. Archived from the original on 15 April 2017. Retrieved 31 July 2017. 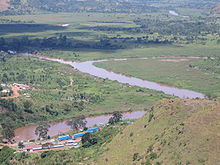 ^ "Sobat River". Encyclopædia Britannica Online Library Edition. Encyclopædia Britannica. Retrieved 21 January 2008. ^ Keding, Birgit (2000). "New Data on the Holocene Occupation of the Wadi Howar Region (Eastern Sahara/Sudan)". Studies in African Archaeology. 7: 89–104. ^ Carmignani, Luigi; Salvini, Riccardo; Bonciani, Filippo (2009). "Did the Nile River flow to the Gulf of Sirt during the late Miocene?" (PDF). Bollettino della Societa Geologica Italiana (Italian Journal of Geoscience). 128 (2): 403–408. doi:10.3301/IJG.2009.128.2.403. ^ Salvini, Riccardo; Carmignani, Luigi; Francionib, Mirko; Casazzaa, Paolo (2015). "Elevation modelling and palaeo-environmental interpretation in the Siwa area (Egypt): Application of SAR interferometry and radargrammetry to COSMO-SkyMed imagery". Catena. 129: 46–62. doi:10.1016/j.catena.2015.02.017. ^ Although the ancestral Sahara Desert initially developed at least 7 million years ago, it grew during interglacial periods and shrank during glacial ones. The growth of the current Sahara began about 6,000 years ago. Schuster, Mathieu; et al. (2006). "The age of the Sahara desert" (PDF). Science. 311 (5762): 821–821. doi:10.1126/science.1120161. ^ Warren, John (2006). Evaporites: Sediments, Resources and Hydrocarbons. Berlin: Springer. p. 352. ISBN 3-540-26011-0. ^ Said, R. (1981). The geological evolution of the River Nile. Springer Verlag. ^ Williams, M.A.J. ; Williams, F. (1980). Evolution of Nile Basin. In M.A.J. Williams and H. Faure (eds). The Sahara and the Nile. Balkema, Rotterdam, pp. 207–224. ^ Salama, R.B. (1987). "The evolution of the River Nile, The buried saline rift lakes in Sudan". Journal of African Earth Sciences. 6 (6): 899–913. doi:10.1016/0899-5362(87)90049-2. ^ Salama, R.B. (1997). Rift Basins of Sudan. African Basins, Sedimentary Basins of the World. 3. Edited by R.C. Selley (Series Editor K.J. Hsu) pp. 105–149. ElSevier, Amsterdam. ^ "Hymn to the Nile". ARCJOHN. March 23, 2010. Retrieved November 20, 2016. ^ a b Springer, Lisa; Neil Morris (2010). Art and Culture of Ancient Egypt. The Rosen Publishing Group. p. 8. ISBN 978-1-4358-3589-4. ^ a b Chisholm 1911, p. 698. ^ Yule, Henry. Sir Henry Yule, Cathay and the way thither: being a collection of medieval notices of China Vol. II (1913–16). London: Hakluyt Society. pp. 209–269. ^ Oestigaard, Terje; Gedef, Abawa Firew (2014). The Source of the Blue Nile: Water Rituals and Traditions in the Lake Tana. Cambridge Scholars Publishing. p. 36. ISBN 1-4438-6791-8. ^ The Present State of Egypt, 1678. ^ S. Whiteway, editor and translator, The Portuguese Expedition to Abyssinia in 1441–1543, 1902. (Nendeln, Liechtenstein: Kraus Reprint, 1967), p. 241. ^ Chisholm 1911, p. 693. ^ "Big Canal To Change Course of Nile River" Archived 5 September 2015 at the Wayback Machine. October 1933. Popular Science (short article on top-right of page with map). ^ D.F. Manzer and M.P. Barnett, Analysis by Simulation: Programming Techniques for a High-Speed Digital Computer, in Arthur Maas et al, Design of Water Resource Systems, pp. 324–390, Harvard University Press, Cambridge, Massachusetts, 1962. ^ Cambanis, Thanassis (25 September 2010). 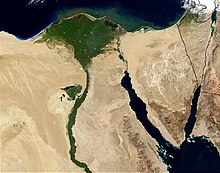 "Egypt and Thirsty Neighbors Are at Odds Over Nile". New York Times. Archived from the original on 27 September 2011. Retrieved 25 September 2010. ^ National Geographic wrote an article about this trip in its Magazine issue dated May, 1955. 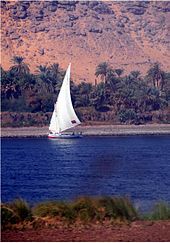 ^ They chronicled their adventure with an IMAX camera and two handheld video cams, sharing their story in the IMAX film Mystery of the Nile released in 2005, and in a book of the same title. Grogan, Ewart S. (1905). "The Nile as I saw it" . The Empire and the century. London: John Murray. pp. 809–16. This page was last edited on 18 April 2019, at 09:19 (UTC).